Mark Carver was convicted of the murder of UNC Charlotte student Ira Yarmolenko eight years ago. But for the past 2 weeks, his defense has been arguing in court that his conviction should be overturned. 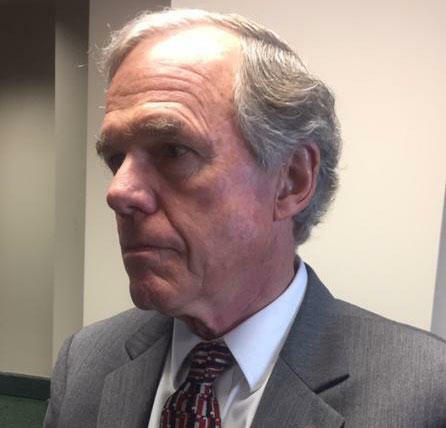 On Friday both the state and defense made their closing arguments and the decision is now in the hands of Superior Court Judge Christopher Bragg who is expected to rule in June. Gaston County DA Locke Bell speaks to reporters after closing arguments. From the very start of this 9-day hearing, Chris Mumma, Mark Craver’s attorney, has argued three main points: One, that he received ineffective counsel during his trial in 2011; two, that Carver’s low IQ and weak physical strength made it impossible for him to have committed the murder of Ira Yarmolenko; three, that the DNA evidence used to convict him was invalid. The state, of course, argued the opposite. They said Carver had two capable attorneys in 2011, that he was intellectually competent, had enough physical strength to commit the murder, and that the DNA evidence used to convict him 8 years ago was solid. After closing arguments Friday the defense quickly left the courthouse. Gaston County District Attorney Locke Bell spoke to reporters. Bell said he has no doubt of Carver’s guilt. "I’m convinced beyond a reasonable doubt and always have been since we looked at the evidence that he’s guilty that he and Mr. Cassada did it," Bell said. I’ve never wavered and looking at all of this evidence I still believe he’s guilty." Bell also said Carver got a fair trial in 2011. Both Carver’s family and members of Ira Yarmolenko’s family came to court throughout the hearing. Yarmolenko’s family sat quietly near the front of the state’s side. Bell said this trial has brought a lot up for them. "They are having to relive the horror and this is very, very sad. There was finality and all the sudden there is not finality. And they are having to sit there and listen to someone try to get their family member’s murderer off. " One of the last remarks Mumma made during her closing arguments was that Mark Carver is innocent and that Ira Yarmolenko has not had justice. Bell wouldn’t comment whether he would appeal if Carver’s conviction is overturned. "To say what I would do if something happens," he said, "I try never to do that."